Once fall arrives, I live in anticipation of the holiday season - that fairy tale world of twinkling lights, cozy family time, gift-giving, and gatherings over a good meal. Sweets and treats are surely part of that image and regardless of how close reality is to fantasy when it comes to the holidays, I find myself impatient, with fingers tapping, wondering when I can start baking Christmas cookies already! Cookies are coming...but aside from cookies (and lots of chocolates - this is when I stock up on some extra special chocolates), I also think of warm indulgent drinks to sip and savor. I tried Barcelona hot chocolate a couple of winters ago and it became our Christmas morning drink. I recently auditioned another contender with this Bicerin (pronounced: bee-chair-EEN), a coffee and chocolate drink native to Turin (Torino), Italy. Torino is a part of the Piedmont region in Northern Italy. When I think Piedmont, I think hazelnuts and given my love of all things chocolate-and-hazelnuts, I always pay attention to anything associated with Piedmont. Well, this drink, Bicerin, which translates into "small glass" in Piedmontese (for how the drink was originally served), has been around since the 18th century when it was served at the cafe, Al Bicerin. But forget the small glass; after trying it, I want as big a glass as I can get my hands on! 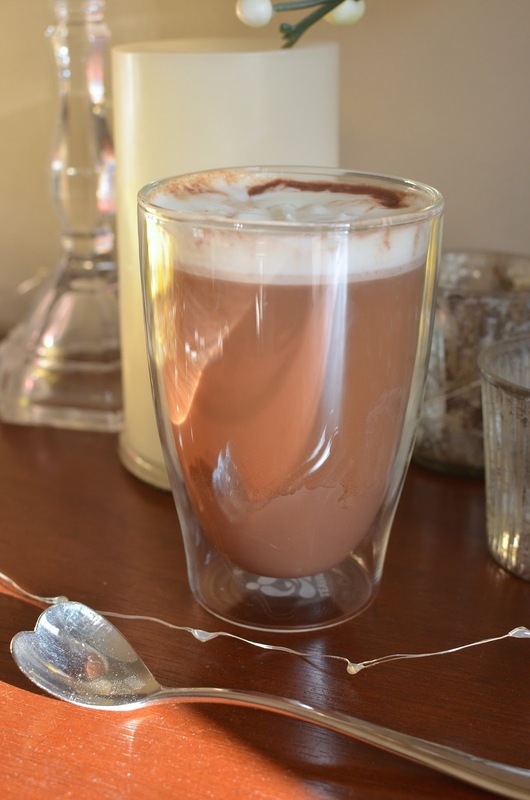 This delicious drink consists of three parts: a base layer of rich hot chocolate, followed by strong coffee or espresso, topped with a final layer of lightly whipped cream. It's rich and absolutely delicious for any fan of the coffee and chocolate combination. I have been wanting to try David Lebovitz's recipe for Bicerin for a long time and I am very happy I finally have. Even dialing down the amount of chocolate I used for the base layer and using my regular drip coffee, the drink turned out sensational. It was a great accompaniment to breakfast on a cold morning last weekend. The nice thing about making things at home is you can customize it to your liking. Maybe you prefer your drink with a little less hot chocolate and a bit more coffee, or the reverse. Use espresso instead of strong coffee if you have it. And instead of whipped cream, you could top it with milk foam for a lighter version. I prefer mine with plenty of rich chocolate flavor and the whipped cream was a wonderful treat. 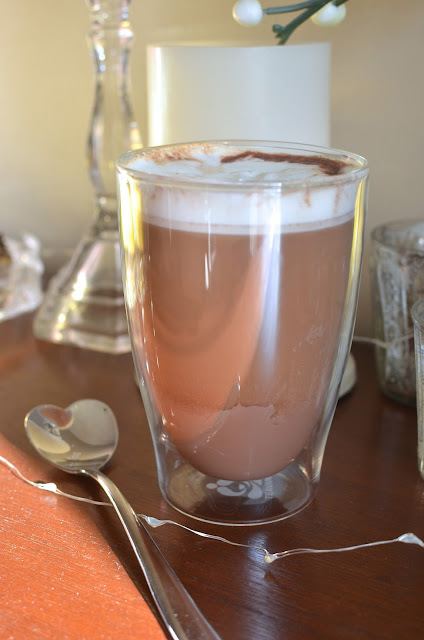 It's great to see the layers in the drink (if you look closely) but I like giving it a stir before taking a good sip and enjoying that wonderfully robust chocolate and coffee combination. It will warm and cheer you right up! As my husband would say, "I be cheering for Bicerin!" It's certainly a great drink for a cold day during the holidays! Warm milk and chocolate in a small saucepan over medium heat. Whisk the mixture until it begins to boil, then let it boil for another 1 minute, whisking constantly. The chocolate mixture will foam up a bit. Remove from the heat and set aside. Whip cream with a spoonful of sugar and about 1/2 teaspoon of vanilla extract (optional) until it's soft and billowy. To make the drink, fill the bottom third of a clear heat-proof glass with the hot chocolate. Pour in another third of coffee over the back of a spoon into the glass (this helps separate the layers). Lastly, top with a few spoonfuls of the freshly whipped cream. Note: If you don't find the drink sweet enough, feel free to stir in some sugar, to taste. We found it was just right without the need for more sugar. 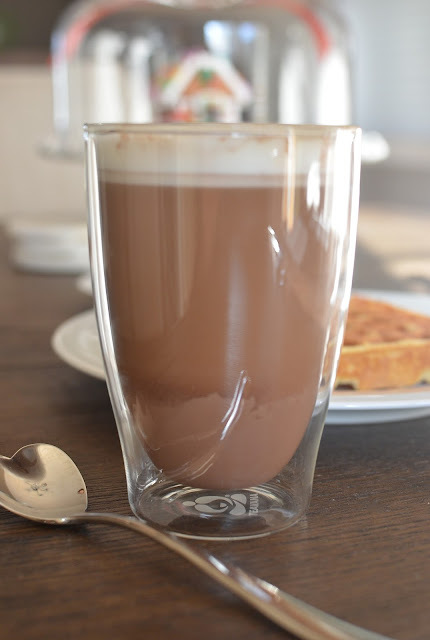 I have never had a Bicerin..but a hot chocolate with coffee sounds like what I exactly want now. It's really good, if you're into chocolate and coffee. I have really come to enjoy the combo. This is simple perfection for sure! I cannot wait to try it. What a great recipe for this time of year and the holidays too. Maybe it will snow soon and we can have a great excuse to make this. Thanks for sharing Monica! What a fabulous drink, sounds like the perfect pick me up. Making one of these this afternoon, love your trick about using the back of the spoon, will be trying that. Thanks Monica! I hope you try it and enjoy it, Cheri! The back of the spoon tip from D. Lebovitz seems to work but I'm not all that good or patient with things like that. You'll want to stir it up so I suppose it's no matter. Enjoy! How have I never heard of bicerin before!? I mean chocolate ... espresso ... it's so right up my alley! haha and I'm with you - I am really trying to hold out on the christmas stuff until thanksgiving but my will is breaking... lol Hope you have a most wonderful turkey day Monica!! haha - tell me about it! I love learning new things so I can keep making/tasting things I enjoy. Chocolate and coffee is one of them! Hope you have a wonderful Thanksgiving with your family, Ashley! I know any food you make for it will be amazing! I have never heard of Bicerin, Monica! But the recipe sounds wonderful and I can’t wait to try this. What a delightful looking drink, Monica, I've made something similar sometimes but never with coffee, and now, if you ask me, I think the coffee is the best in it, so I definitely have to try it. :) And I feel the same about fall and Christmas anticipation, it starts on November 1st and is all I think about until Christmas. And then I am dissapointed that the Christmas days are gone so fast. I so agree with you! Enjoy every moment of the holiday season, Adina! This is a totally decadent beverage! Exactly what i was looking for! This sounds delicious, I can see this being perfect on a late weekend morning. I love that this has espresso in it! I am definitely going to try this as soon as it gets cold in Texas. It's very tasty and a great treat for a cold day; hope you like it! I've never heard of Bicerin before, so thank you Monica for teaching me something new! I love rich chocolatey beverages this time of year. Happy Holidays! I love learning and tasting something new, too. Thank you!